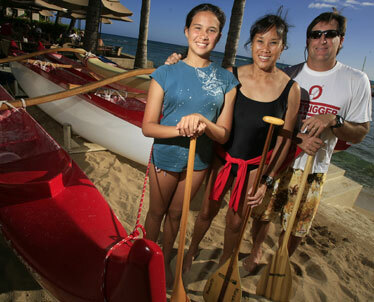 Rachel Kincaid, left, and her parents, Genie and Chris, are committed to paddling, both individually and as a family. Rachel paddles with the Outrigger Canoe Club team, coached by her parents. Her dad is a four-time Molokai Hoe champion. If you think your family is busy, spend a week with the Kincaids. Husband-and-wife coaching team Chris and Genie Kincaid manage their careers, raise two teenage daughters, coach Rachel's paddling and volleyball teams and still find time to pursue their own athletics. "We make it work because we're committed to an active lifestyle," said Genie, a 52-year-old veteran outrigger canoe paddler. Added Chris, also 52 and a four-time Molokai Hoe champ: "It's fun and it keeps your life young." Paddling keeps the sports-minded Kincaids afloat. The active lifestyle supports Chris and Genie's marriage and allows them to spend quality time with their daughter Rachel. Paddling coach Chris Kincaid watches a group of 14-year-old girls -- his daughter included -- in six-man canoes as they practice rounding a buoy in an ocean surging with a massive swell and high tide. Meanwhile, his wife and fellow coach, Genie Kincaid, kneels to draw a diagram in the sand for the girls awaiting their turn. "The technique has to stay, especially when it's rough," Genie explains. "You just gotta make yourself do it." "I had the wisdom to recognize that I'd better participate with my husband before we grew apart. And I had a blast. We were hooked and I've been paddling ever since." The Kincaids know a thing or two about this kind of self-discipline. Few families are as devoted to their sports and manage such hectic schedules. As practice ends, Chris supervises removal of the canoes and waits for their daughter Rachel, whose Outrigger Canoe Club team they have coached for four years. Quickly, the parents make a transportation plan, before Genie rushes off for a workout with the upper-division women. Two days later, Genie supervises some of the 17 girls on the team in the club's trainer -- a dry-land model of a canoe with troughs of water on either side that allow paddlers to work on stroke technique -- while Chris runs time tests on the ergometer (rowing machine) in the weight room. During each test, Chris sets down his clipboard and drops to his fists for a series of push-ups, or squats with a weighted barbell perched on his shoulders, before noting each girl's results on his chart. In addition to their own training in one-man canoes, six-man canoes, at the gym and on the ergometer at home, the Kincaids coach Rachel's paddling team three times a week. Sundays are spent at the regatta. And that doesn't count Rachel's club volleyball team, which Genie coaches with Kisi Haine through four practices and/or games each week. "We make it work because we're committed to an active lifestyle," said Genie, a paralegal for Damon Key Leong Kupchak Hastert. Their lives together began about 25 years ago. Chris, 52, an avid surfer who grew up in California and earned a degree in math and a master's in statistics from San Diego State University, connected with Hawaii residents attending SDSU who encouraged him move to the islands. He now co-owns Pacific American Lumber, a wholesale distributor of specialty building products. Genie, 52, grew up in Kaneohe. She attended St. Andrew's Priory and Northwestern University, where she played volleyball. Chris remembers their first "real" date, because he had just started paddling for Outrigger Canoe Club and missed practice the next morning. Genie was playing competitive tennis at the time. But after a trip to nationals in the mid-1980s, she quit because she never saw Chris. "I figured he wasn't going to play tennis, so I started paddling novice for Outrigger. I had the wisdom to recognize that I'd better participate with my husband before we grew apart," Genie said of her 24-year marriage. "And I had a blast. We were hooked and I've been paddling ever since." She's lost track of the number of Molokai Channel races she's completed, but knows she missed only a couple due to pregnancy and childbirth. What she loves most about the sport is that it satisfies her urge to participate, compete, coach, stay fit and eat whatever she pleases. Best of all, nobody can reach her by cell phone. "Back then, paddling was pretty much the central point of our lifestyle, and it still kind of is," added Chris, who has won four Molokai Hoe world championship races in the open division. The Kincaids' two daughters grew up in the water -- often at the Outrigger Club. Genie began coaching when their older daughter, Jessica, now 17, started paddling. Soon Genie found herself juggling coaching duties for both Jessica and Rachel, now 14, along with her own practices. "Eventually, I had to get Chris involved because I was coaching two teams," said Genie. "I said, 'What's wrong with this picture? You're the four-time Molokai champ!'" Chris readily agreed, and took over Jessica's team, while Genie prepped Rachel's crew. "Initially, it was selfish, because we wanted to spend time with our kids," said Chris, who still paddles competitively at the masters level. When Jessica's interests took her away from paddling and Rachel's crew began to expand, both parents gravitated toward Rachel's sports. "We have expectations of any crew," Chris said. "If you're going to be out there working with us, we expect you to pay attention, respect the coach and respect your teammates. It's a great way to influence other kids' lives. We're not trying to be their parents. But they need positive influences, and I think we have a pretty good way of doing things." Daughter Rachel agreed, indicating that those expectations were even higher for her. "You have to live up them, especially if they're the four-time winner of Molokai," she said. "You have to work harder so you can impress them and stand out." Asked if she enjoyed having her parents at every practice, she smiled and shrugged. "I've never had a paddling coach that wasn't my parent." Without a trace of typical teen irony, Rachel went on to explain how much she likes joining them for workouts, and added, "My parents are great." Chris is "kind of the silent backbone, and Genie is real outspoken and strict," said paddler and volleyball player/coach Haine. "The cute thing is they call each other 'mom' and 'dad.'" It seems the example the Kincaids set with their own pursuits is just as important as the time they spend coaching. They never sit around; instead, they're doing pull-ups, or going to the gym in the evening, or paddling the ergometer or inviting their kids out for a walk or a run. Often, they paddle one-man canoes on Kaneohe Bay, where Genie claims the much stronger Chris frequently backtracks for her. "It's just a matter of staying motivated, and it's definitely getting harder and harder (with age)," Chris said. "But it's fun and it keeps your life young. And as far as the marriage goes, it really helps. It certainly keeps us together quite a bit." Both admit that the demands claim a lot of time and energy, forcing some household duties to the side. But both are committed to coaching Rachel's teams until she graduates from high school. Until then they'll tackle the daily challenges of raising children, managing their careers, coaching and maintaining their own athletics one day at a time. How? "You don't sit down and whine about it," Genie said. "You do your best."